How powerful is advanced population aging?—powerful enough to place at risk the liberal content of Europe’s democratic regimes? In this essay I’ll argue that it could; that today’s confident clusters of European and East Asian liberal democracies (states rated as “FREE” in Freedom House’s annual survey) will, as they age beyond the median age of 45 years, incur greater risks of losing elements of the political rights and civil liberties that generations of their citizens and political leaders worked hard to attain. How sure am I of the impending risks? In fact, I’m not sure. There is yet no historic record of states experiencing advanced aging. 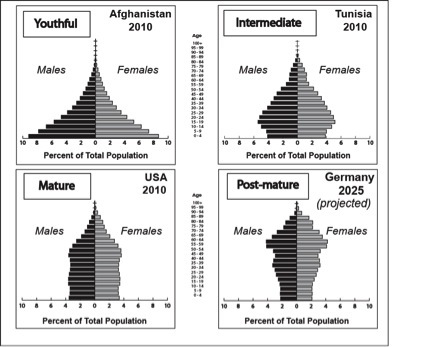 Despite the well-documented evidence of increasing democratic stability as country-level populations age (Weber 2012, Cincotta & Doces 2012, Cincotta 2008/09 & 2008), current theory cannot hope to forecast political behaviors for countries well beyond the median age of 45—beyond the current demographic frontier and outside the reach of available data. While no country has yet evolved a deeply post-mature age structure (Fig 1. 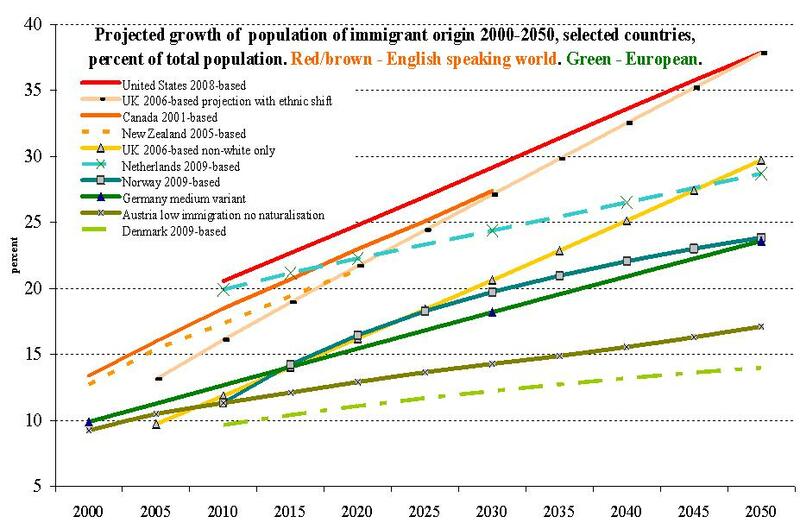 ), by 2030 some will. According to demographers at the US Census Bureau’s International Program Center and the UN Population Division, by 2030, between 19 and 29 states will possess this novel quality. Three or four will be East Asian states. Nearly all the rest will be located in Europe. According to current US Census Bureau and UN Population Division projections, by 2030 both Germany’s and Japan’s populations will range near the median age of 50 years. Figure 1. 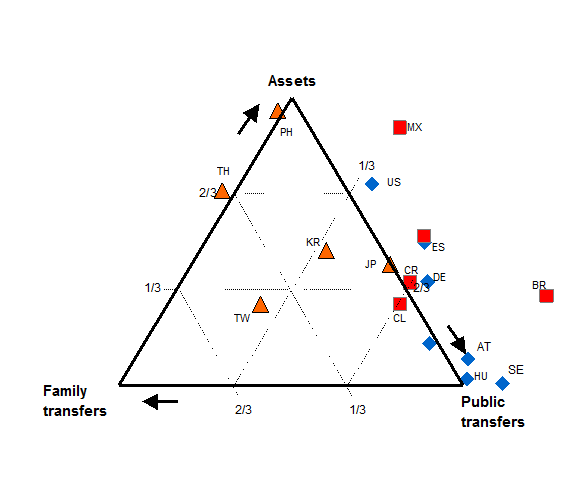 Population age structures indicative of four phases of the age-structural transition. So far, aging (an increase in the median age) has been “good news” for liberal democracy. Since 1972­—when Freedom House (FH) produced its first state-by-state assessments of political rights and civil liberties—the global demographic pattern of liberal democracy has been extraordinarily consistent. Among states with a youthful population (median age 25.0 years or less) the annual proportion of states assessed as FREE (Freedom House status score from 2.5 to 1.0) has been relatively low—around 18 percent, on average, over the past four decades (Figure 2). Around 60 percent of all intermediate countries (median age 25.1 to 35.0 years) and about 88 percent of mature countries (35.1 to 45.0 years) have received the “Free” assessment. Figure 2. 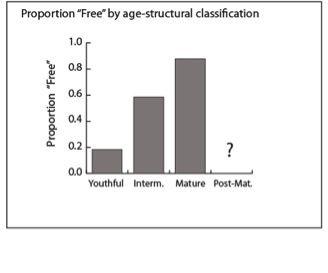 The mean annual proportion of states in each of three age-structural categories that were assessed as FREE in Freedom House’s annual survey, 1972 to 2011. More importantly, youthful liberal democracies have shown themselves to be inherently unstable. 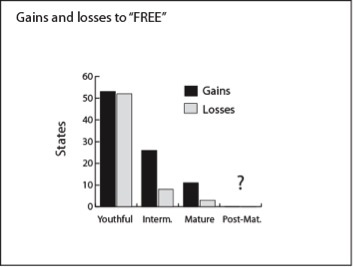 Over the past four decades, youthful states have ascended to FH’s annual list of FREE regimes on 52 occasions. On 51 occasions, youthful states dropped off of that list, retreating to a less democratic or even autocratic regime in the wake of a coup d’état, after elected or unelected leaders have assumed extraordinary executive powers, or when political violence has led to restrictions on individual freedoms. As a group, 235 Chapter 20: The Importance of Big best-data-recovery.com to Business . 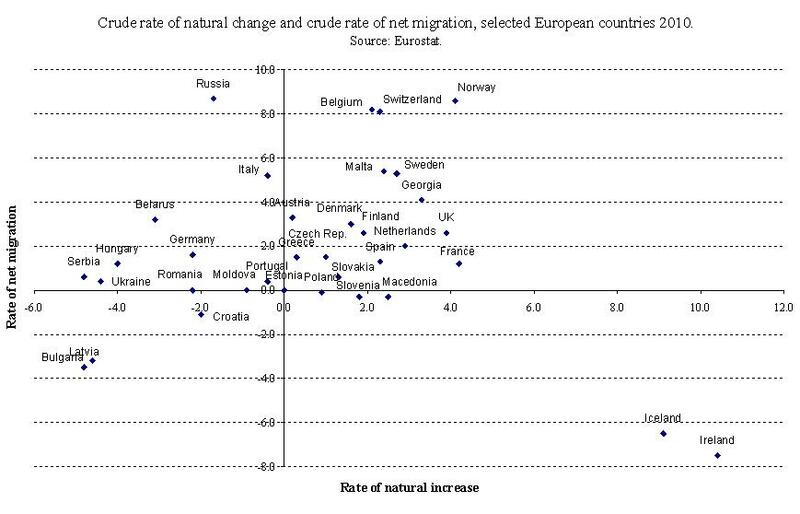 states that have ascended to the FREE category as eitherintermediate or mature populations have experienced much greater success at maintaining this rating (Figure 3). In fact, liberal democracies over the median age of 30 years seem the most stable. From this politico-demographic vantage point, Huntington’s third wave of democracy—an empirical wave of Published November 3, 2013 by ObamaCare Facts Wondering why your health travel health insurance reviews policy was canceled online casino going into 2014? Let”s take a look at why many Americans are losing their policy, how ObamaCare played a part, and why it could be a good thing or bad thing for you depending on the situation. successive democratization that began in southern Europe in the early 1970s—owes its accumulation of liberal regimes neither to popular revolution nor to gradual regime-motivated reforms, but to the democratic stability attained as population age structures mature. But that was then—before any liberal democracies ventured beyond the median age of 45. Only the passage of time will allow an evaluation of the durability of post-mature liberal democracies. For now, political demographers are left to search among the behaviors of aging states for premature indications of democratic setbacks. Figure 3. The absolute number of states, by age-structural type, that newly attained and lost the status of FREE in Freedom House’s annual survey, from 1973 to 2011. Do such indications exist? Perhaps. Nearly all of the rapidly aging states along Europe’s southern flank have fallen into some degree of fiscal distress—and the shakiest among them appears to Men best-horoscope.com can’t stand boredom. be Greece, now at a median age of 42 years. Under the pressure of civil disorder, Greece’s government has backed away from fiscal reforms and tough austerity measures. Although still assessed as FREE in FH’s most recent annual survey (Jan. 2012), Freedom House downgraded Greece’s political rights score (from 1.5 to 2.0). In Eastern Europe, declines from high levels of liberal democracy have been more obvious and widespread. Ukraine (median age of 40 years) dropped from FH’s FREE rating to PARTLY FREE in 2009. While remaining with FH’s FREE status, both Latvia’s (median age of 41 years) and Hungary’s (40 years) scores have trended toward declining political and individual freedoms over the past two years. Nonetheless, few political scientists are ready to investigate the possibility that some of this drift away from liberal democracy is related to advanced population aging. Perhaps they should entertain the thought. In the case of Greece, one can easily imagine the rising burden of public pensions and old-age healthcare contributing to public sector deficits and the loss of fiscal flexibility, particularly during a global recession. For Ukraine, Latvia and Hungary, most experts will argue—with justification—that the strength of democratic institutions and liberal traditions in these post-communist states is still weak. That said, some have had difficulty explaining why these particular eastern European states, where the transition from state communism to liberal democracy went relatively smoothly (and enthusiastically), and not others, have experienced significant erosion of press freedoms and weakening of executive-judicial separation. Could these lapses in “liberalness” be symptoms of the degree of fragility that, in the future, analysts will expect from post-mature liberal democracies? Just as age-structurally youthful democracies bear high statistical risks of a retreat to a less democratic regime type in the wake of intra-state conflict and electoral violence, perhaps post-mature liberal states will find themselves vulnerable to more subtle expansions of executive power and decay of judicial checks. 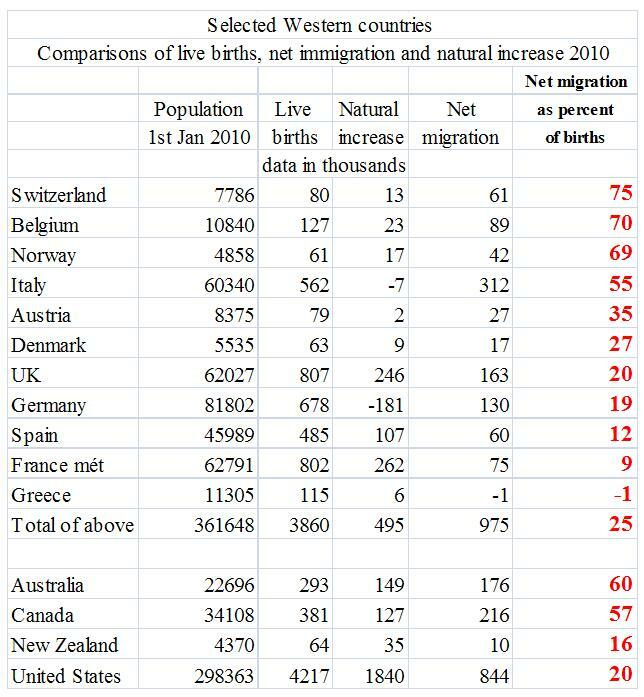 Significantly, no recent overt signs of illiberalness have emerged from within the world’s oldest aging states: Germany, Japan and Italy. Apparently, these have (so far) taken their rapid pace of aging in stride. Despite its fiscal problems, Italy (the next in line to enter the post-mature category) was recently upgraded by Freedom House—from 1.5 to the highest average rating, 1.0. Still, the history of advanced aging is just beginning, and depths of their future aging challenges have yet to be plumbed. 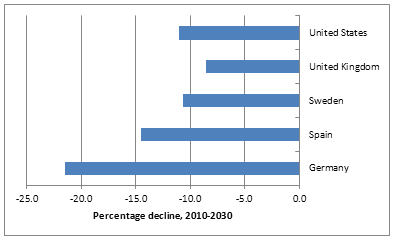 By 2030, roughly 28 percent of all Germans and 26 percent of Italians are expected to be aged 65 and older. 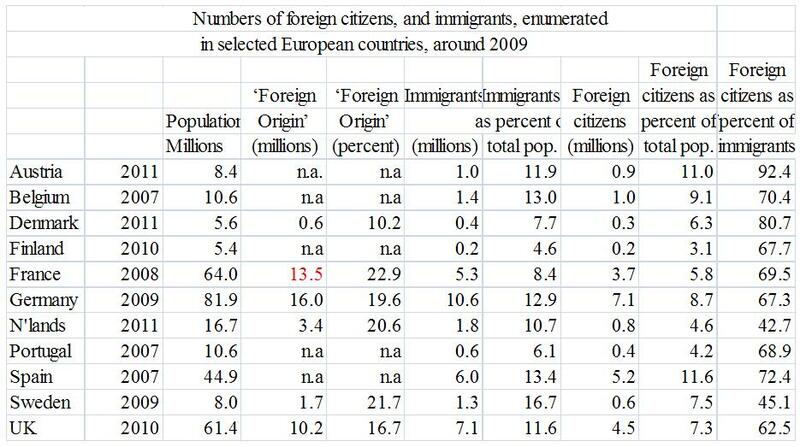 For Japan, that figure is should reach 30 percent by the same year. How well-anchored are liberal political and institutional traditions in the societies of Europe’s and East Asia’s aging liberal democracies? Will these traditions permit prompt and adequate policy responses to aging’s oncoming challenges? So far, we cannot know. After all, we stand at the beginning of a new history. Richard Cincotta is Demographer-in-residence at the Stimson Center in Washington, DC, and a consultant on political demography for the Woodrow Wilson Center’s Environmental Change and Security Program. From 2006-09, he served as a long-range analyst for the National Intelligence Council. Cincotta, R. P. (2008). “How Democracies Grow Up: Countries with Too Many Young People May Not Have a Fighting Chance for Freedom.” Foreign Policy (165): 80-82. Cincotta, R. P. (2008/09). “Half a Chance: Youth Bulges and Transitions to Liberal Democracy.”Environmental Change and Security Report(13): 10-18. Cincotta, R. P. and J. Doces (2012). 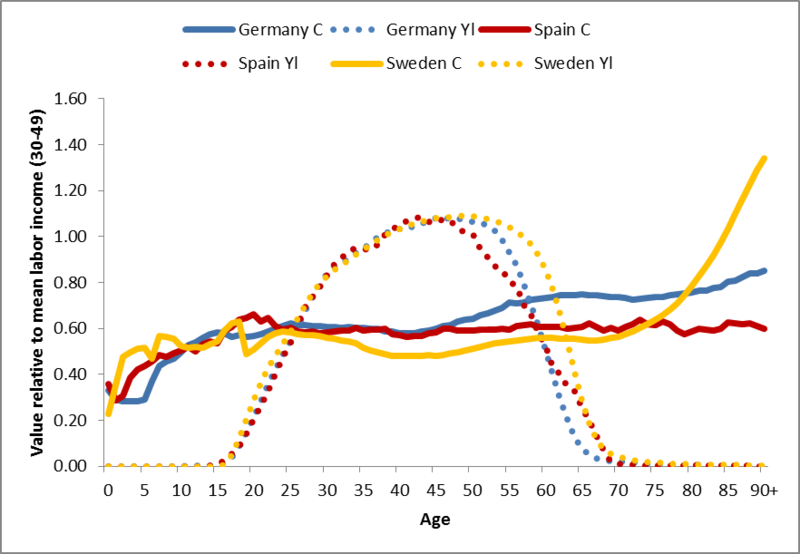 The Age-structural Maturity Thesis: the Youth Bulge’s Influence on the Advent and Stability of Liberal Democracy. Political Demography: How Population Changes Are Reshaping Security and National Politics. J. A. Goldstone, E. Kaufmann and M. D. Toft. Basingstoke and New York, Palgrave-MacMillan, pp.98-116. Weber, H. (2012). “Demography and Democracy: the Impact of Youth Cohort Size on Democratic Stability in the World.” Democratization, iFirst (1-23).